We were at the county fair today. Pookie had a little bit of trouble riding the bumblebee ride. The one that goes around in circles and you push the bar forward to go up and backward to go down. We let him ride it with Pookie and he just sat there with his hands over his ears. We came back after lunch to give it another try. This time I rode with him so that I could show him how the ride works. He started off covering his ears but as soon as he realized that we were in control of the bumblebee it got a little more interested. He pushed us up and down for the next 3 minutes and bounced out of the ride at the end. 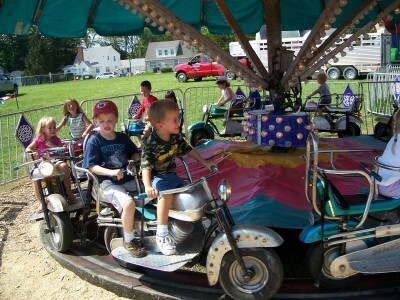 We rode a couple more of the kiddie rides including the motorcycles. Doesn’t Pookie look thrilled. He’s the one in the red hat on the back of the motorcycle. We had been through a long day already at this point so I figured it might just be time to think about packing it up for the day. Geetle said she wanted to go ride the real horses that walk in a circle. Pookie immediately said, “No horses” confirming my belief that he was done for the day. The next thing I know, he starts running away. BeAGoodMom wrote about some recent experiences we have had with that. I hate the runaways and the tantrums that follow so we have been working double time on teaching him to tell us what he wants so that we can avoid some of those tantrums. I grabbed his arm and got down low to make eye contact and asked him what he wanted to do. Now, I don’t care what roller coaster he had his heart set on, we were going to ride it. Considering the heat and tiredness and previous runaway difficulties, this was definitely going to be a positive reinforcement moment. It ended up being a two story roller coaster that loops back and forth in a figure eight and climbs and drops those 8 feet or so. Pretty tame but much more intense than the even kiddier rides he had been on. Since he wasn’t very into the other rides I didn’t expect much and when we sat down he covered his ears and buried his face in my shoulder. I removed his hands and started talking about how much fun the ride was going to be. Then it started moving. I started talking excitedly about the big hill and how fast we were going and shouted a few “Whees.” Pookie started getting into it and had a blast the entire ride. He definitely enjoyed it more than the other tamer rides. I’m starting to learn that covering the ears doesn’t always mean that there is an unpleasant noise or sensation. Sometimes it seems to mean he just doesn’t understand what he is supposed to do and a few minutes of explanation could be all that is needed.